This evening I was spending some time reading my usual blogs from families involved with adoption when I was blown away by a post… I hope that it will blow you away as it did for both Travis and I. God is really moving in the world and we look forward to how He is going to further use us throughout this journey! See what you think…..
“I want you to imagine for a moment that you woke up this morning to the following headline: ”One Hundred Jetliners Crash, Killing 26,500.” Think of the pandemonium this would create across the word as heads of state, parliaments and congresses convened to grapple with the nature and causes of this tragedy. Now imagine, that the very next day, one hundred more planes crashed-and one hundred more the next, and the next, and the next. It is unimaginable that something this terrible could ever happen. But it did – and it does. It happened today, and it happened yesterday. It will happen again tomorrow. But there was no media coverage. Yet more than 26,500 children died yesterday of preventable causes related to their poverty, and it will happen again today and tomorrow and the day after that. Almost 10 million children will be dead in the course of the year. 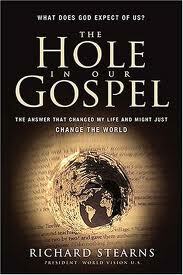 You can believe we are heading out to Amazon to place our order for “The Hole in our Gospel”! I LOVE when God blows us away, and verifies His calling upon our lives!!!! What an amazing God we are serving! Ok, so far I’ve let Faith take care of writing updates and her thoughts on the blog, mostly because she’s so good at it and we’re both on the same page anyway. However, after a recent situation that happened, I feel it’s time for me to weigh in and make my debut! For those of you who aren’t familiar with the adoption process, the first couple of months include a LOT of paperwork! We have to get employment verifications, financial information, Power of Attorney so AWAA can act on our behalf, training, a fire and safety inspection, and way too many other documents to even name. All of those listed (and again, many others) have to be notarized so they can be authenticated. Recently we’ve used our bank to notarize many documents, as there are 2 notaries on staff and it’s within a couple blocks from our house, making it very convenient! For most of it, we used one of the notaries, a very nice guy who seemed genuinely interested in our adoption and process. NOTE: A lot of people are uninformed of the adoption process, simply because they have nothing to relate it to or no experience or knowledge of the process. Fair enough…I would also consider myself uninformed in the process prior to starting this journey. However, I (and most people, I think), like to think that I know what an appropriate question is and isn’t. In some of the books we’ve read, we’ve heard story after story of people asking questions that you think “Whoa, did you really just ask that about us?” This week, we had our first real experience with this. With all of that in mind, Wednesday we had a couple more things to get notarized, so we again went to the bank, documents in hand, but this time we were taken to see the notary we had never worked with yet. He started out asking a few polite questions about the process. Pretty soon he asked (and I’m not paraphrasing)…….wait for it…… “So now it’s my turn to be nosy, but can you not have kids of your own?”. DUDE! DO YOU EVEN KNOW OUR NAMES WITHOUT LOOKING DOWN AT OUR DRIVER’S LICENSES!!! Now I have 2 feelings about this whole situation and “the question”. My first feeling is that, yes, many, many people have, are, or will wonder that exact same question that he asked, and I totally understand and accept that question. It’s a fair question. But I tend to think before I ask questions of people with whom I’ve never met. It’s a little different if we have some sort of an established relationship with them, where they are able to ask “So, why adoption?” and let us volunteer the information as to whether or not we can “have our own”. I’m sure it was an innocent question, but let’s stop for a minute and think how it comes across when you ask it the first time you meet!!! Now I do have a second feeling about that question. My second thought only applies to my/our situation. In some ways, I actually don’t mind when someone (that I do or don’t know) asks that question. For all of you who have been wondering what the answer to that question is (but don’t want to ask, now that I’ve ripped people who ask :), the answer is……wait for it……we don’t know if we can or can’t have children by birth, and it doesn’t really matter if we can or can’t. If the Lord blesses us later with children by birth, great! If he chooses to not allow us to create children biologically, we’re fine with His decision. Either way, adoption, for us, is a calling that we are being led to follow. When people ask me this question, I want to use it as a way for me to witness to them, explaining how God’s calling is the reason we’re adopting. Ok…so that got me thinking about other things. Back a few paragraphs, I used the term “children of our own” or “having our own”. These are pretty common phrases people use, without a lot of thought. We’ve even said this a few times, without really thinking. Let’s stop and think of those phrases for a little bit though. “Children of your own”…do you mean children that we own as opposed to children we rent or borrow? Because I’m a parent of a child who I’ve adopted, does that mean they’re not really “my own”? I’d venture to say that since they 1) are a part of my family, 2) have my last name, 3) are loved and cared for by me, 4) call me “dad” and my wife “mom”, and 5) Ohio and the US has my name listed as their father on their new birth certificate…they are MOST CERTAINLY MY OWN CHILDREN!!! Being creative as I am, I came up with a parallel that I think is very relevant. Pause and look back at the title of this post………………ok, I’m assuming you did, and saw it is titled “Rent-A-Center, Child Edition”. Who among us has met someone, you get to talking, and find out perhaps they just got married, graduated, or moved…happens all the time right? Here’s what I’m thinking of asking the next time I’m in that situation. “So, when are you going to get your own house, or are you just going to keep renting?” Rude? Uh…yeah that would be totally rude to ask. It would sound degrading- like they don’t really have a home unless they own it…renting doesn’t count. When someone asks “Can’t you have your own children?”, what I hear is “You’re really not a parent if you adopt…that’s like renting…they’re not really yours.” What would that feel like if you were a child who was adopted? People would be saying “You don’t really count because you’re just adopted.” You want my honest take on it? Are you sure? Because I’m going to be totally honest with you, and some of you might not like my answer. So, I’ve warned you. Think about this for a second…you can NOT be a Christian if you do not get adopted by a Middle Eastern, Jewish, single man, who was considered by some to be a heretic and criminal. How’s that for trans-cultural adoption?? If you consider yourself to be a Christian, YOU HAVE BEEN ADOPTED!! Still think being adopted is lesser than being a child by birth? Jesus went to the local Rent-A-Center, found us, and paid for us in full so He would own us. He doesn’t pay for us month to month, where we can get repo’d if He doesn’t make the payment. HE OWNS US FULLY and WE ARE HIS CHILD!!! Who prays, “Dear God our Adopted Father…”? No, we pray “Dear God OUR FATHER.” We make no distinction between adopted and “by birth”, yet no Christian was Christian by birth. When we became Christian, God offered to adopt us, and we said, “Sure!”. So why is it any different when we as humans adopt other humans? Ok…I could keep going on and on and on, but perhaps I’ll stop here, let you digest and think about this for a bit, and I’ll come back later. I started this post meaning to simply explain what happened this week and my thoughts on it, but (this has been happening more and more lately), once I got on this topic of adoption, I get extremely passionate! If I was typing this while on video, at times you would’ve seen tears coming down my face. When I talk about our journey, all I can see is the face of our child(ren(, and all I can think is……hold on, gotta go grab a Kleenex…………………………….I wonder where my child is right now…? I wonder if he or she is ok…? I wonder if they know someone loves them dearly and can’t stop thinking about him or her…? I wonder if he or she is alive right now or still developing in mama’s belly…? I ache to hold him. I ache to take a nap with her laying on my chest. I can only see myself holding her in church, tears streaming down my face as I hand her over to the pastor to be dedicated. I want to play trucks and cars with him. I want to braid her hair and paint her nails. I can’t wait to teach him how to hold a hammer and build a birdhouse for mommy. I don’t want to spend another Father’s Day without being a Father. After you watch it, I’d LOVE to know your thoughts!